They had provided her with substitutions and she had lived safely in the brightness of false things. We know that the book we will never write will be bad. Even worse will be the one we put off writing. At least the book that has been written exists. It may not be very good, but it exist, like the miserable little plant in the lone flowerpot belonging to my crippled neighbor. Fernando Pessoa, The Book of Disquiet. As an undergraduate I studied a number of languages with varying degrees of success. Spanish, Latin, Hebrew and Ancient Greek. It was this last that that completely defeated me. After just one semester, I dropped out of the Greek class. From talking with others both back in the olden days and more recently, the difficulty of ancient Greek is widely recognized. So I approached the 480s with trepidation: there would be no avoiding attempting to re-learn Greek. What I recalled was that in my class, there were a pair of graduate students who were similarly being crushed by the Greek class and who talked about switching instead to a Biblical Greek class being offered through the Institute for Antiquity and said that it was allegedly much easier. Given that memory, when I looked at the books on the shelf. 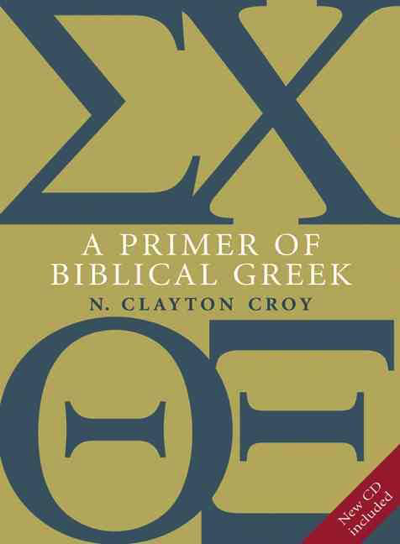 I decided to pick a book on Biblical Greek, and whether I was just lucky in my choice of text or those long-ago grad students were correct, I found myself having a much easier time with Biblical Greek. I imagine it’s both, but this text does an amazing job of introducing the complexities of Biblical Greek. Each chapter ends with four sets of exercises, a set of sentences for translation from Greek which are presumably composed by Croy, a set of passages from the Septuagint, a set of passages from the New Testament (these latter two have supplementary vocabulary provided which is explicitly not expected to be learned) and finally a short set of English sentences to be translated to Greek. The later chapters have a few words that don’t manage to make it into either the main or supplementary vocabularies but Wiktionary provides an invaluable resource for being able to find words both in canonical and inflected forms much to my relief. It took me nearly two years, but I worked through all 32 chapters and all the accompanying translation exercises and my phobia of ancient Greek has been alleviated. I’m almost ready to pull my old Attic Greek textbook off the shelf and give it another try. I continue to not progress well with my writing. 2019 is looking like it’s going to be a difficult year. Just 1,369 words on the novel which represents me slowing down even more than I had previously. Short story statuses: I’ve not yet come back to the long story, nor have I made much progress on the new story. I did get the story I workshopped in early February into submissions, with no responses yet. Rejection continue to get me down although in the midst of all of this, I finally got an acceptance. Numerically my submission stats are still in the toilet, though. Pearl’s life … avoided meaning as the bird does the snare. Everything was sleeping as if the universe were simply a mistake, and the hesitant wind was a limp, unfurled flag on top of a nonexistent building. I woke in the cobalt part of the dawn. Sara Nović, Girl at War. Having touched the feet of Christ is no excuse for faulty punctuation. As the fact that I’m half a month late in posting this might attest, I’ve not been doing so good with my resolutions. Only 1,573 words on the novel which is worse than January. Short story statuses: The revisions on the long story have been problematic and I put it aside for a while. The story I workshopped in early February is in the midst of revisions and the story which was almost done is ready for workshopping even if I’m not. Meanwhile little to no progress on a new story. My rejections have had me down. I’ve been getting mostly form rejections of late which has put my positive response rate to the lowest it’s been since before I published my first story. At times I’m almost ready to give up on all of it. 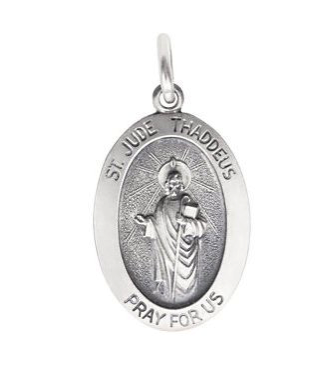 The earliest version of “Saint Jude’s Medallion” came from an assignment for a class I took as an undergrad, Latinos and the Politics of Religion. We were supposed to interview an older Latino/a (the term Latinx had not yet been invented or at least had not achieved currency in the Pomona Valley of the late 80s) about some aspect of folk theology. The rest of the class were Latinx themselves and had only to call up abuelita and record a conversation with her to complete the assignment. I should have made arrangements to find someone to speak with, but I procrastinated and had to come up with something quick with no resources. So I created a work of fiction purporting to be truth (a friend majoring in political science told me later that what I considered to be a relatively venal sin was, in fact, a grave ethical violation. These sorts of issues were not usually matters of concern in the English department). The original version of the story ended with the conversion of the narrator’s boyfriend, but when I revisited this story on my return to writing, I found that conclusion to be saccharine and unsatisfying. I came up with the conclusion that I did when in the course of researching contemporaneous terminology for the rail line that the narrator used to travel to the South Side neighborhood of Chicago I read about the train crash that takes place near the end of the story which seemed purpose-made for my needs. An early version of this story was workshopped in the writing group I was in with Georgene Smith Goodin, and was rejected many many times before I brought into a writing class I took with Lee Strickland at StoryStudio Chicago where it was met with violent disapprobation by my classmates. I took Lee’s comment about the narrator’s English being too good to heart and I rewrote all of her dialogue in Spanish, did a literal translation of the Spanish into English and then cleaned up the resulting broken English to make it read better. I put it back into submissions and got still more rejections, all of them form rejections. My first hint that it wasn’t something I should trunk was a personalized rejection from Barcelona Review praising the writing. A couple weeks later, Switchback responded offering publication.